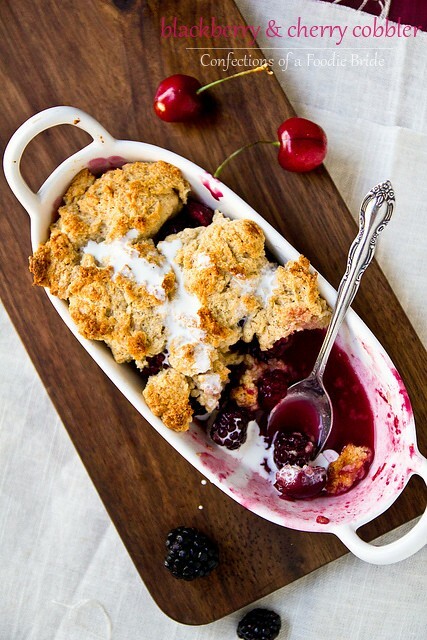 It’s cobbler season! Anything you could possibly want to bake under a sweet dumpling crust is in season and super affordable right now. To celebrate, we took two perfectly ripe summer fruits, blackberries and cherries, and baked them into one magnificently bubbly, new-white-sun-dress-staining dessert. I’m old enough to know better. Now I’m hoping that I’ve sacrificed enough over the years to the OxyClean gods to save it. Growing up, cobbler and banana pudding were the “cooked” desserts of choice. An iced-down watermelon and ice cream truck fare were the non-cooked favorites. It didn’t hurt that blackberries grew wild along our fence line and took only minutes to gather enough for cobbler when you send four kids out with four bowls. I’m less discriminating and lack the self control to turn down anything topped with a scoop of ice cream or a drizzle of cream. 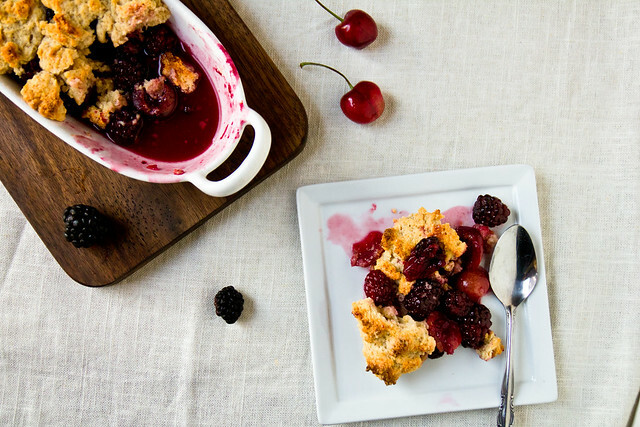 Celebrate summer's best with a blackberry and cherry cobbler. Preheat oven to 375. Lightly grease a glass pie plate. Stir the blackberries and cherry halves with sugar, flour, lemon zest, and salt in a large bowl until blended. Transfer to the baking dish and set aside. In the same bowl, stir together the flour, sugar, baking powder, cinnamon, and salt until well mixed. Create a well in the dry ingredients and add the egg, buttermilk (or yogurt), butter, vanilla, and almond extracts. Stir, mixing until you get a soft dough. Bake the fruit is bubbling and the topping is nicely browned, about 40 minutes. I’ve been a lurker for quite some time. 🙂 Your recipes are amazing. This one looks sooooooo good, I was forced to comment. Can’t wait to try with all that delicious summer fruit. Thank you! I’ve been making a lot of cherry desserts lately – made your roasted cherry brownies last night and waiting to try them at lunch!…..how on earth do you keep your nails/fingers/nail beds from not getting stained and making you look dirty for days afterwards??? and is there any easy way to pitt cherries that i’m unaware of???? I use a cherry pitter but my hands still look grungy. I picked up a pitter last week and can’t wait to use it. 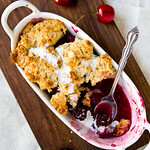 This cobbler is calling me! The cobbler looks delicious. I’m adding this dessert to my menu. Yum! SO jealous that berries grew in your backyard! I guess here in SoCal we have oranges/mandarins and avocados… but that is totally not the same! 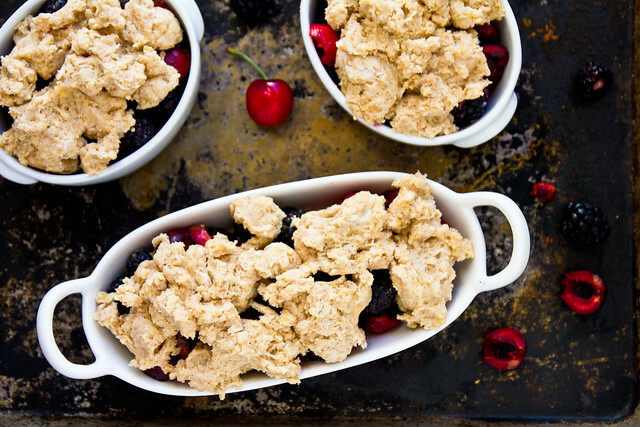 If i had berries like that, I’d be making this cobbler every day and becoming superwoman because of the antioxidants. THIS is what summer is all about. And for the record, I’m on your mom’s side–both about the cobbler needing ice cream and about the ice cream needing to be Blue Bell. To this day, it’s my favorite. I lack the self control to say that any dessert as delicious as this can only be eaten at a certain temperature! I’ll take it however I can get it, that’s for sure. What a fabulous recipe! This sounds so delicious. I see that you only have 1 tbsp of flour to thicken the fruit. Is that enough to keep it from being really runny? Can cornstarch be substituted? I made this today. So good. Must restrain myself from eating the entire dish.